Get Started with Realm or check out the source on GitHub. Unlike regular, server-side databases, you can use it directly inside your iOS apps (and soon Android apps) to store & query data locally on the device, allowing you to build apps faster, build apps that are faster and craft previously impossible experiences. When we were working on Realm as part of our YCombinator batch, we were struck by the observation that despite all the innovation around databases over the last decade, mobile had been totally left behind. There’s been an explosion in the number of database for the server-side, with several projects starting to rival old stalwarts MySQL and PostgreSQL in popularity. The issue of course is that none of these databases can actually run on phones, tablets or wearables, because they were never designed for that in the first place! since the introduction of the iPhone in 2007, but none for mobile. 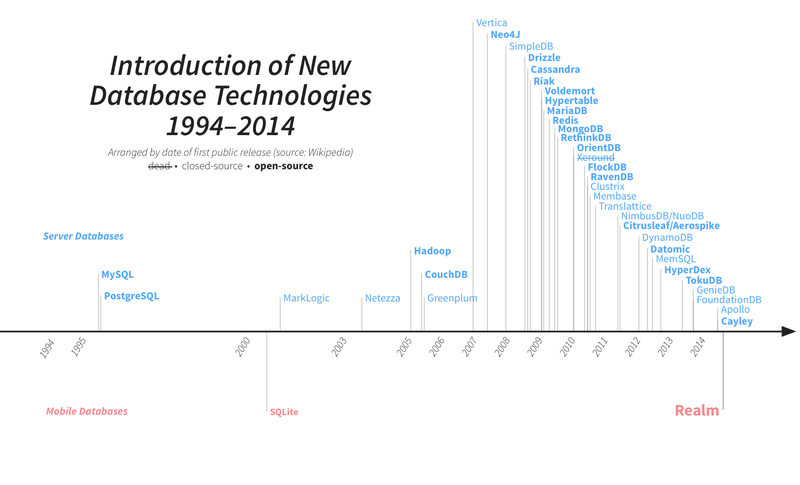 If you’re a mobile developer, your only viable option today is the same as it was in 2000: SQLite. It’s used for persistence by virtually every mobile app today — either directly or through one of the many libraries that provides a convenience wrapper around it such as Couchbase Lite, Core Data, ORMLite, etc. SQLite was revolutionary when it launched in 2000 but developing mobile apps in 2014 is obviously a very different beast than it was 14 years ago, and our notion of what a “phone” or “app” is has also changed drastically. We saw a clear opportunity to provide a fresh start for data on mobile with an easier API and an architecture that benefits from the last decade of innovation in databases. In short, we’re the first mobile-first database. Mobile as we know it is barely 7 years old after all — still in its infancy — and many fundamental needs, long served server-side, still need an answer on mobile. We build Realm in the hope that it answers one of these needs for you, and we will work hard to make sure it becomes & remains your go-to solution whenever you need to handle data in iOS, Android, wearables, and beyond. Additionally, we’ve baked in powerful features including object relationships, meaning you can map one-to-many/many-to-many relationships or full graph scenarios (yes, we remain extremely memory-efficient even as you traverse arbitrarily deep). Plus, we offer the ability to do linear migrations so you can easily update your data in production. “I got up and running with Realm in literally a few minutes. UPDATE: we’ve updated the charts above to reflect changes in measurements since this article was originally published. In particular, the original insert benchmark was not reusing compiled statements for SQLite, but now does. The numbers were obtained from tests run on an iPad Air using the latest available version of each library as of Sept 15, 2014. If your app handles just a few hundred records, Realm will make it extra zippy, but we’ll also keep your app happily humming even if it manipulates datasets with millions of records. Previously available databases would either not respond within acceptable timeframes or just crash your app under such loads. Realm’s efficiency comes from years of work on a custom C++ core designed to fit the needs of much more primitive devices, that leverages bit-packing, caching, vectorization and a zero-copy architecture to realize truly amazing gains in memory usage and speed. Since Realm internals allow for easy concurrency and measurement of deltas and follows an MVCC model, we are also working on adding sync capabilities to Realm. We’ll talk more about the core in upcoming blogposts. Realm has been in development since 2011 and has been used in production at Zynga & others since 2012. We’re very excited to finally open it to the public and are confident that it is safe to use in your apps today. We do expect to refine the API and add new features based on feedback from developers, and we’ll be very responsive to fix any issues. You can always talk to a live human developer on GitHub or with the #realm tag on Stack Overflow. What does it mean for you, the developer? We’ve seen a few very interesting things happen so far in apps that use Realm. 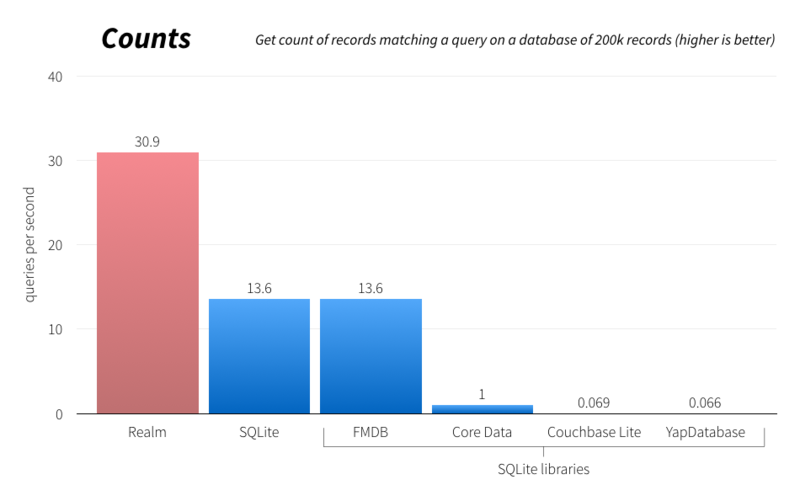 Dealing with Core Data or SQLite can be a huge pain. One developer we met confessed to spending 2–3 months of every 6-month project just dealing with Core Data bugs & peculiarities — and he was a seasoned app developer with 5 years experience including several internally at Apple. All these wasted cycles added up quickly whether he was in-house trying to launch apps on a schedule, or just reducing his margins while he was contracting. We built Realm to be so simple to use, you can actually spend your brain power building an app, not debugging it, and in practice, it can save you months of work every year. It’s no secret that becoming an app store hit is getting harder. There is a huge pressure right now to offer smooth experiences and deal with increasing amounts of data in games or other apps. 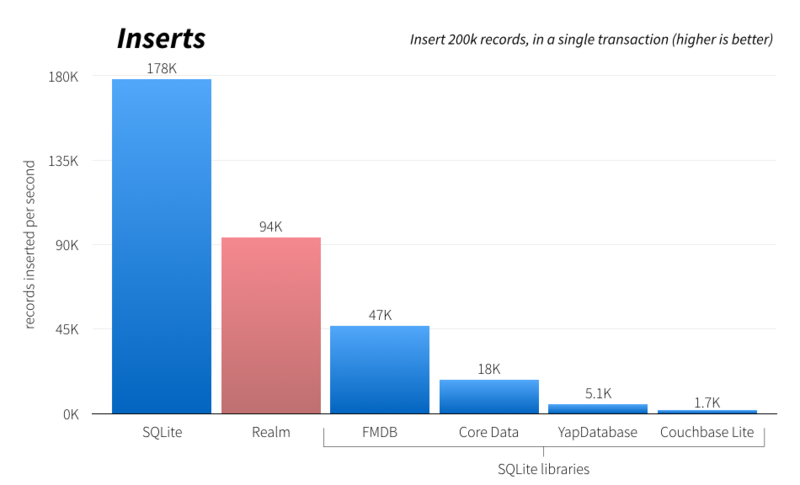 Realm’s speed and capacity to handle datasets with millions of objects can help. Developing mobile apps has been incredibly limiting so far, with most of the complex tasks offloaded to servers. This often means that your users will be waiting a few tenths of a second to a few seconds while you compute things server-side and send it back over spotty networks. Instead, Realm lets you work instantly on the supercomputer your users have in their pocket. The added bonus is that every query you run locally, multiplied by your number of users, makes your server-side bill ever so lighter. We’ve found this to be a huge plus for small startups whose main operational cost to reach 1M users is their server-side infrastructure — using something like Realm can be the difference between life & death for them. We’ve also seen the savings in practice at big companies such as Zynga, who were able to go from running gigantic database clusters server-side, to just storing Realm files on simple data stores like Amazon S3. Adding local persistence for offline access is often seen as an extra and time-consuming step, and is widely requested by users. In contrast, we’ve found that if you just replace your custom app objects with Realm objects, you often get offline mode for free. It won’t solve things like offline writes without a bit more work, of course, but it’s a painless way to let people see their data and interact with it while offline without incurring any extra work. We truly believe Realm opens a new realm of possibilities for app developers. Whether’s it’s handling more data in their apps without crashing, having smoother UX, or manipulating complex objects easily instead of trying to cram them in relational tables, we’ve seen users build amazing, previously impossible experiences on Realm. We look forward to sharing theirs & yours on this blog in the future.